Hello! So I went back to College this week after half term and it has started to get really cold! Today I left home at 9.30am which wasn't too bad as it had started to warm up a little by then but not much! I bought a new coat the other day which I am in love with. It's thick and has fur on the edges and is so warm and cosy! This coat is perfect for Autumn/Winter and you can see the fluffy lining in the photo! 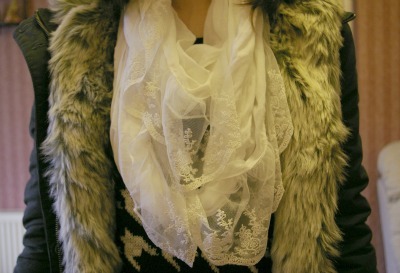 The scarf I'm wearing isn't very warm or wintery but I thought it was pretty! The jeans I'm wearing are the Topshop Leigh jeans which are my favourite jeans ever! If I'm wearing jeans then they are always these ones. I have two pairs in black as well! My shoes are grey Converse which I bought the other day! I have wanted some Converse for a while now and they are so comfy! They are perfect to wear when it's too cold for dolly shoes but I don't want to wear boots. 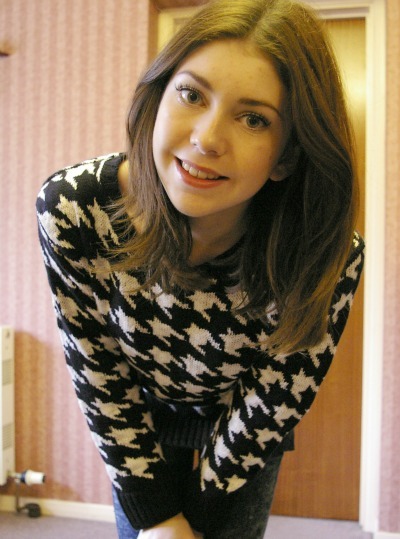 My jumper is actually from Primark! I bought it yesterday and I really like it! I think Primark are starting to do some nicer things recently (they still don't beat Topshop for me though!) I love the dogtooth pattern and it's also pretty thick and warm! That is my outfit that I wore today! I am now at home because I finished college just before 12 this afternoon! Please let me know if you like OOTD posts because I really like doing them. I love your scarf and your sweater! Great outfit!! your scarf is gorgeous! I love scarves so much! Love the scarve and the jumper!! 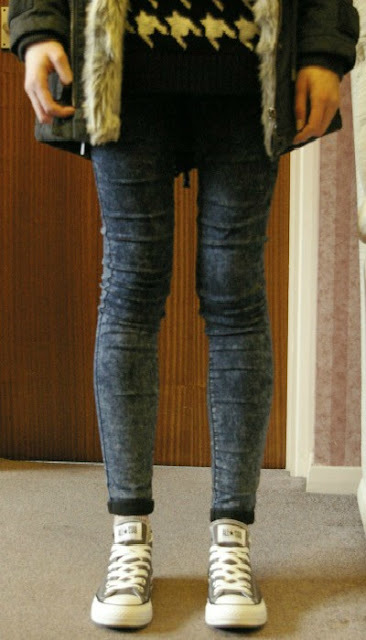 Great OOTD post as I love the jeans and jumper. So nice and warm and just perfect for college. I agree with you about primark! They are upping their game. I love those jeans, I've been after a pair for ages but then I can never bring myself to spend £40 on jeans. Maybe for christmas! Your hair looks lovely like this!